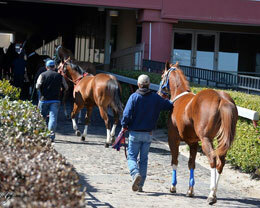 Remington Park kicks off schooling races for 2-year-olds on Wednesday. OKLAHOMA CITY, OK—FEBRUARY 5, 2019—Remington Park will kick off the first of several training race dates for 2-year-olds on Wednesday, with an 8-race card. Post-time has been set for 11 a.m. (CDT) and all races will be conducted at a distance of 250 yards. A number of summer sale yearling graduates, as well a couple who sold as short-yearlings in the 2019 Heritage Place Winter Mixed Sale, will make their career debut on Wednesday. Trainer Clinton Crawford will saddle $35,000 Heritage Place Winter Mixed Sale graduate Kiss A Little More for owner Don Cavenaugh. The colt by first-crop sire, champion Kiss My Hocks, from the Mr Jess Perry mare Sweet P, will start in Race 5. This is the first foal for Sweet P who is a sister to three black type including All American Juvenile winner Jm Mister Destiny and a half-sister to two-time champion and world champion sire FDD Dynasty. This is also the family of champion Apolitical Blood. Also starting in Race 5 is Separate Party, a $19,500 Heritage Place Yearling Sale graduate racing for Victory Farms and trainer Samuel Valdivia. The gray filly from first-crop sire Separate Interest is out of the Corona Cartel mare Corona Party Girl, a half-sister to La Primera Del Ano Derby(G2) winner Fancys Fist Affair. This is the immediate family of Los Alamitos Two Million Futurity(G1) winner I Like The Odds. CLICK HERE to download Wednesday's training race program courtesy Lazy E Ranch and OQHRA with assistance from TRACK Magazine, StallioneSearch.com and American Paint Horse Association. Training results with individual times for the horses will be posted on StallioneSearch.com on Wednesday as soon as they become available.